The latest version of GWX Control Panel, the program that helps protect your Windows 7 or Windows 8 PC from unwanted Windows 10 upgrades and notifications, brings you a new level of convenience and control with some key new features. As always, you can find full documentation and download links at the GWX Control Panel announcement post. Note to anyone who picked up the 1.6.0.0 version that was up earlier: a minor but recommended update, 1.6.0.1 is now online! To avoid installation headaches, please see the "Upgrading From Previous Versions" section below. Monitor Mode. This optional feature actively monitors your computer and notifies you if it detects any known evidence of Windows 10 activity. Previously you used to have to run the program manually from time to time to make sure your settings hadn't changed. Now, with monitor mode enabled you'll know immediately when it's time to review and update your settings. Monitor Mode is implemented via an icon in the notification area of your taskbar. You can double-click the icon at any time to bring up the GWX Control Panel window, and right-clicking the icon displays a menu. And unlike the Get Windows 10 app, this one includes an Exit option! Just click Enable Monitor Mode to turn the feature on; it will persist across Windows restarts. You can permanently turn the feature off by then clicking Disable Monitor Mode. Worry-free installer. While GWX Control Panel is still available as a stand-alone executable, after receiving numerous requests for a traditional installer I have developed one that provides the following conveniences: It creates shortcuts in your Start menu and on your desktop for easy access to GWX Control Panel and documentation. It will allow for safe upgrading to future versions of GWX Control Panel without leaving duplicate copies of the program laying around with different filenames like you might sometimes experience with the stand-alone version. And finally, it provides a standard uninstaller routine, available in the Programs and Features control panel. And while you are wise to be wary of freeware programs that include installers, please rest assured that GWX Control Panel does not (and will never) include any garbage bundled software. The installer exists solely because many users find it more convenient to access programs via easy-to-find shortcuts, and it provides some consistency in installation paths (which helps make the new Monitor Mode feature work more seamlessly). But as I mentioned, a stand-alone version is still available. Check for Updates. The built-in Check for updates feature tells you what version of GWX Control Panel you're currently running and takes you to the Ultimate Outsider Downloads page where you can download the latest version if a newer one is available. This feature is available from the system menu (the little icon in the upper-left of the GWX Control Panel window) or from the right-click pop-up menu of the Monitor icon. Save Diagnostic Info. This new feature saves a text file to your desktop that contains your current Windows 10-related settings and error messages encountered during the current GWX Control Panel instance. While this is purely for diagnostic purposes, it will be tremendously helpful to me in situations where users report unexpected behavior. The text file includes info on where to send the file if you encounter unexpected problems with GWX Control Panel. This feature is available from the system menu (the little icon in the upper-left of the GWX Control Panel window) or from the right-click pop-up menu of the Monitor icon. Update November 24, 9:45PM PST: I just uploaded a minor update, version 1.6.0.1, which fixes a couple problems people reported to me. I will fully document the new features and tweaks in the user guide when I have a chance. You will find links to both the installer and the stand-alone executable version of GWX Control Panel at the Ultimate Outsider Downloads page. To access the system menu, left-click the little icon in the upper-left of the main GWX Control Panel window. The system menu of the main GWX Control Panel window. To access the Monitor pop-up menu, right-click the Monitor icon. The right-click pop-up menu of the Monitor icon. The new installer is supposed to seamlessly upgrade your installed copy of GWX Control Panel to the latest version, but I've heard one report of an "error opening file for writing" problem that occurs if the Monitor Mode icon is enabled while you're trying to upgrade. I will fix this in the installer, but for now here's a fail-safe way to work around the issue. 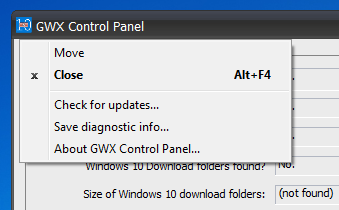 Right-click the GWX Control Panel icon in your system tray/notification area and click Exit on the shortcut menu. Also manually close any other currently-running GWX Control Panel instances. 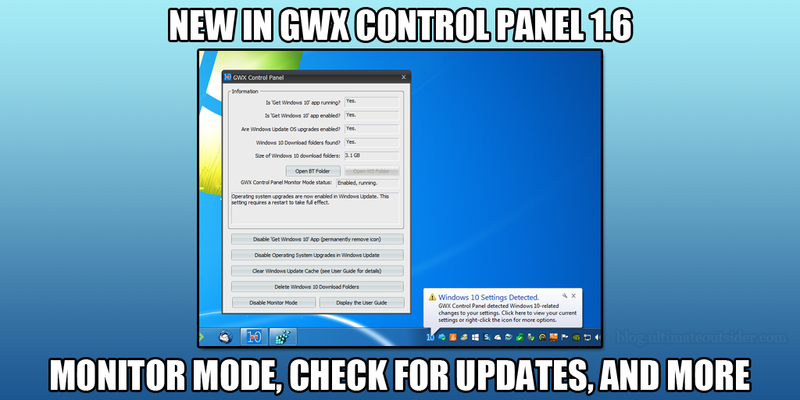 Run the newly-downloaded GwxControlPanelSetup. It should work this time. If you ever decide to send a PayPal donation (link on sidebar), you can use the "add special instructions to recipient" field to include a personal note. I read and respond to all of those. I had GWX 1.5 installed and then downloaded and installed 1.6.01. After that my Windows Media Center listings all disappeared and would not update. Now I'm back to 1.5. @Kathi - I'm sorry you experienced that. I can't think of anything the program does that would have any effect on any other applications or system components, but I am also not a Media Center user, so don't really have a way to test. Could you tell me the exact symptoms you saw, and perhaps which features of GWX Control Panel you used? Did you use the 6.1 installer or stand-alone mode? All GWX Control Panel settings except for "delete download folder" and "clear windows update cache" can be reversed by just re-enabling/disabling anything you had previously disabled/enabled in the program. So if a particular setting it changes DOES affect something else unexpectedly you should be able to restore the old behavior.